Makani is a World Class Sailing & Snorkeling Experience in Honolulu. Makani, the finest Hawaii catamaran offers a covered cabin seating area, two large, freshwater restrooms, Bose surround sound system, LCD TV, sunbathing net areas, and pilothouse seating. No expense has been spared making Makani the catamaran of choice for the most discriminating customers, including many celebrities. The Captain and crew will attend to your every need. We hope you will make Makani your first choice to “Feel the Thrill” and have an unforgettable Hawaiian ocean experience. Hop aboard the Makani Catamaran and get ready to make a splash! Sail along the scenic south shores of Honolulu and Waikiki with the crisp morning sun upon your face and the wind in your hair. 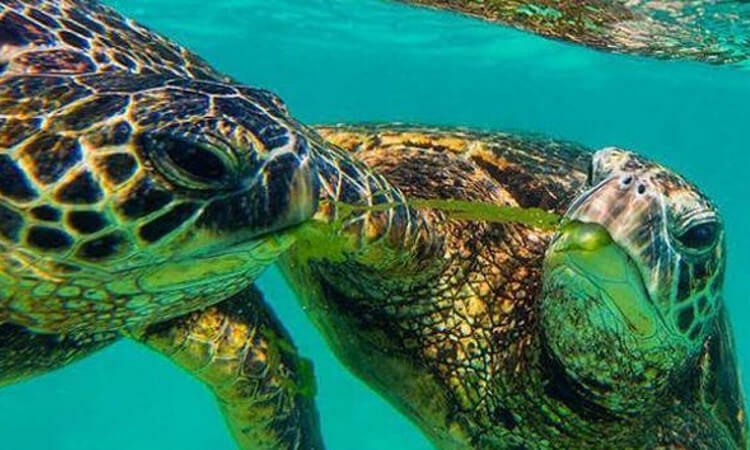 Dive in and snorkel with tropical fish and sea turtles in the warm and clear waters of Hawaii’s famed Waikiki Beach. After an exciting snorkel, t off towards Oahu’s iconic Diamond Head for a relaxing sail in the sun. Keep an eye out for dolphins swimming and enjoy a sandwich bar with hearty fillings and sides. Be sure to top off a delicious lunch with a High Tide, Makani’s signature cocktail! Customers will receive a full refund with 24 hours notice of cancellation. Last minute or day of cancellations may result in cancellation fees. Customers will also receive a full refund in case of operator cancellation due to weather or other unforeseen circumstances. No Hawaiian vacation is complete without a relaxing sailing cruise! Join Makani Catamaran on an afternoon sail along the island’s scenic south shore. The lush Ko’olau Mountains, shimmering skylines of Honolulu & Waikiki, and majestic Diamond Head make for absolutely breathtaking scenery and are a perfect setting for an unforgettable afternoon on Hawaii’s turquoise waters. On this relaxing afternoon tour of the south shore, you will have a unique opportunity to see dolphins and whales! Spinner Dolphins love to swim in front of Makani’s sleek catamaran hulls and Humpback Whales can often be seen breaching and spouting in the winter months as they nurse their young in Hawaii’s warm water. Complete this tour with a cocktail from the full bar onboard and get ready to have a great day on a sailing cruise with Makani! Get ready for an incredible evening on a dinner cruise like no other. Escape the stuffy dining room and enjoy the open air on a sunset dinner sail with Makani Catamaran! Featuring a delicious island-style dinner buffet, indoor and outdoor seating, and a stunningly beautiful Hawaiian sunset, there’s no better way to bring an end to a day in the tropics than on an evening sail with Makani! As an amber glimmer of the setting sun reflects off the city skyline and the towering peak of Oahu’s famed Diamond Head stands above azure water, you’ll be reminded why you came to Hawaii in the first place…To discover the beauty of paradise! Take your evening to an enchanting new level Makani Catamaran’s fireworks dinner sail! Nothing compares to the open-air setting of sailing along the coast without the typical dining room setting. With the rugged Ko’olau Mountains towering above the shimmering Honolulu skyline and the iconic Waikiki scene of towering hotels in front of Diamond Head, the beauty of your surrounds aboard the Makani Catamaran is matched only by the breathtaking splendor of watching the sun set behind the tropical horizon! Your unforgettable Friday evening will have an incredible ending with a spectacular view of the fireworks show from the waters in front of the action! See the sky light up and take in the magical evening show from the decks of Hawaii’s largest and most luxurious sailing catamaran. A savory island-style dinner buffet compliments the beautiful tropical scenery and a spectacular fireworks finale will bring an exciting end to a perfect day in paradise!